There is an app for anything these days. CrossFit is no exception. If you want a convenient place to keep track of your workouts or get a workout when you can’t get to your box, try one of these. Some are free others cost a few bucks. See the detailed breakdown of each app below. 2 CrossFit Games – By CrossFit, Inc. Founded in 2008, this app helps you log, plan, and analyze your workouts. You can post your results and create your own workouts. You can also track your meals and body fat. And if you want to see how you rank with other CrossFitters, there’s a site-wide results section that lets you do that as well. Beyond the Whiteboard also lets you find what your 1, 3, 5, or 10 rep max on lifts should ideally be. You can analyze other movements to see which ones are your strengths and which ones you need to work on. You are able to keep your info totally private or decide who can view what. It’s even on Facebook so you can go social. The app has gotten better reviews on the Android side than the Apple side. CrossFit Games – By CrossFit, Inc. This is the official app of the CrossFit Games. In it, you can see what the workouts are, submit your scores, and track your ranking. All on either a worldwide, regional, team or masters level. You can even customize the leaderboards. It defaults to your rank first and allows you to share it with your friends. You can personalize the alerts to remind you to submit your scores and the alerts that let you know when the live events are streaming. A great feature is that it allows you to view the live events within the app itself. The general consensus among reviewers is that the app is faster than the site. Over 150 preloaded common WODs, you’ll always have the most up-to-date list of WODs! Backup your WODs in the cloud by signing in with Google or Facebook! Keep your WODs safe if your device is lost or broken! There were only two reviews for this app at the time this article was written. It received a “great app” vote but someone was disappointed that you can only track one PR per movement. On iTunes, there’s only one review at this time so we can’t make a subjective judgment on the app for the iPhone or iPad. There are, however; reviews for the Android version that are not so great. Many complain that the updated version has many bugs that need to be fixed. See your Box Activity, compare your results with your Box members. theWOD Machine – Smart WOD generator and Deck of cards. Get WOD feeds from your Box. Get Daily WODs from all the Boxes working with WODBook. Join your Box or create your own if it doesn’t exist. Track your daily WODs by adding them to your WOD Calendar. Enter results and notes for your tracked WODs. Attach photos to your results. Keep track of your favorite WODs. Keep track of your benchmark WODs. Search your activity by exercise. Search Daily WODs by exercise. User Profile – Total finished WODs, Favorite WODs, Benchmark WODs and data analysis. Get scales of your personal records. Visualize your personal records progress history. Track your results for the benchmark WODs (Girls, Heroes, Travel WODs, Opens). Instructional videos for some of the best benchmark WODs and exercises. Create your own benchmark WODs and share them to your Box. Your data will be synced in real time across all of your devices. Track and visualize each of your benchmark WODs history. Training Timers are included (StopWatch, Amrap, Tabata, Stations, EMOM). According to reviews by users, WODBook still has issues to resolve. One user claimed that you can’t use the app offline. Another said the app was more like a journal because you can’t analyze your results over time. Choose from hundreds WOD benchmarks and train hard! Write your own WODs or add a photo of a whiteboard in your CrossFit box! Attach photos to your results! Don’t know which WOD to choose? WODster will give you a random one! Reviewers gave this app 4-5 stars. The lower rating was because the EMOM timer did not have seconds and you can’t reorder the exercises you put in. This app doesn’t have annoying ads or in-app purchases. The website has tutorials that show you how to use its features including how to save a WOD from your box’s RSS feed, log your workouts, setting and using your 1RM, setting goals, and viewing personal records. According to reviews, it’s user-friendly and they go the extra mile with customer service. 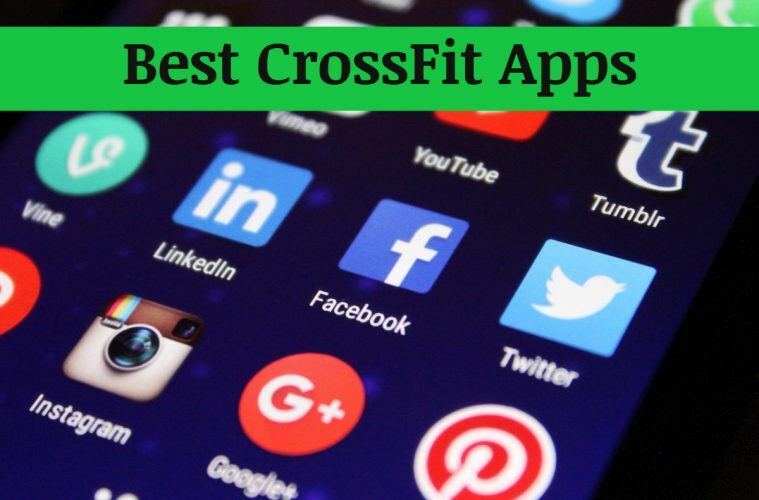 It is important to note that with the exception of the CrossFit Games app, all of these are not affiliated with CrossFit. Taking into consideration how you want to use the app, do your research before downloading or purchasing. It doesn’t hurt to try a few free apps until you find the one you can’t live without.